This image shows Cornelia Crater on the large asteroid Vesta. On the right is an inset image showing an example of curved gullies, indicated by the short white arrows, and a fan-shaped deposit, indicated by long white arrows. A newly published study shows evidence that transient water flowed on the surface of Vesta, in a debris-flow-like process, and left distinctive geomorphologic features. 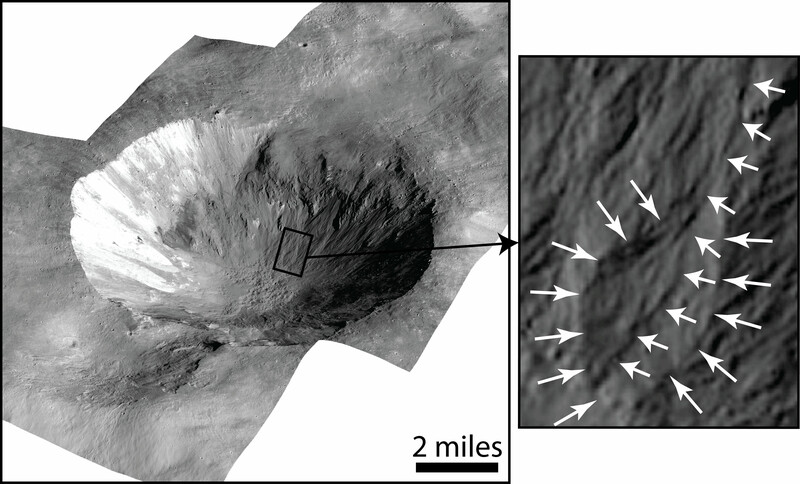 Scully and colleagues, publishing in the journal “Earth and Planetary Science Letters,” identified a small number of young craters on Vesta with curved gullies and fan-shaped (“lobate”) deposits. 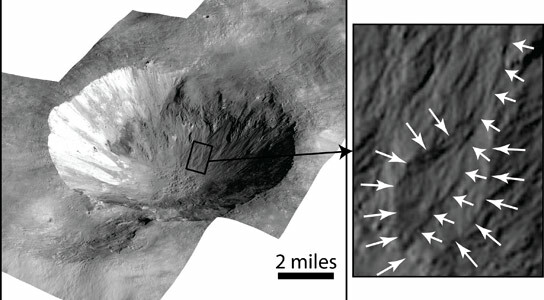 Be the first to comment on "Gullies Suggest Water Flowed on the Surface of Vesta"